Egyptian military sources insist that 'Operation Eagle,' launched in the Sinai Peninsula following the 5 August attack near Egypt's Rafah border crossing with the Gaza Strip, has not been shelved. Rather, they say, the next few days will witness fresh tactical deployments following the collection of fresh intelligence. The operation came in for criticism after being temporarily halted after last month's Eid holidays, with many units pulling back to locations in Beir Al-Abd, Baluza and Kharba. According to military sources, the expected tactical shift will include the abandonment of heavier units. "The army will not leave Sinai until its work is done," the source insisted, while refraining to reveal any addtional information. Regarding ongoing dialogue with Sinai-based jihadist groups, launched two weeks ago as the operation's 'political arm,' Nizar Ghorab, former MP for the Gamaa Al-Islamiya's Construction and Development Party – who is currently spearheading the dialogue campaign – said that a series of meetings were taking place with jihadist and Islamist groups in the area. Ghorab told Ahram Online that the first meeting, aimed at pre-empting an unnecessarily heavy-handed security response, took place last week. "This is why we quickly launched talks with the leaders of these movements – to prevent them from entering into a confrontation with state agencies," he explained. Ghorab added: "We spent time in prison with these men under the former regime, and thus we appreciate each other. This allows us to maintain dialogue with them, and we reiterate that these groups – including those that have taken up arms – no longer need to do this under the new regime, which we support." However, he went on, "there are those who still have the same security mentality of the past and do not want to deal with us on this basis. They insist on purging the state of former regime remnants and security elements. We are preparing a report that condemns the security agencies in this regard, even if the battle between jihadists and the old guard is over. The change of regime means a change in outlook and beliefs, and this should also include Islamist and non-Islamist movements." During their last meeting, he added, "we established that these groups had nothing to do with the Rafah attack, which was the work of foreign hands sabotaging security in Sinai with the aid of local operatives. There are serious concerns that Israel’s Mossad has infiltrated the region." Ghorab went on to say that routine reports on the ongoing dialogue were being submitted to Egypt's presidency. "What is almost certain is that these operations – including the Rafah attack – are the work of foreign saboteurs and not Islamists," he asserted. "All Islamists, including those that belong to armed groups, don't believe in working against the president, but rather want stability and security." The lead negotiator said that the former regime had prompted jihadist groups to move against it because of the regime's blatantly pro-Western policies. "Today, by contrast, these groups have become political, and have no desire to clash with the state, with which they now want to cooperate." argued Ghorab. On Operation Eagle, Ghorab asserted: "We know the operation achieved several of its goals, but the results have not yet been officially announced. There is evidence of this; a number of non-jihadist operatives have been arrested." Commenting on the security appendix to Egypt's Camp David peace treaty with Israel – and whether its terms had led to a security vacuum in Sinai – Ghorab stressed that "terminating the treaty does not mean going to war." He added: "Egypt's political leadership should take this decision [to modify or abrogate Camp David] based on the information that it has access to." Meanwhile, a former key intelligence figure, who preferred anonymity, countered that the ongoing dialogue with local jihadist groups was a "smokescreen." He asserted that these groups were in firm control of all their members, many of whom had been arrested by security agencies after the recent Rafah attack and following earlier attacks on the Egypt-Israel natural gas pipeline. "If these jihadist groups genuinely want to deal with the state, then they must offer something tangible instead of excuses, which is all that we have heard so far," said the source. He went on to criticise the performance of Operation Eagle, the results of which remain ambiguous. "They didn’t have to use tanks, for example, which unnecessarily stirred tensions with Israel," he said. "We have airborne Special Forces capable of eliminating terrorist hotbeds, blocking entrances to mountain caves, and shutting down tunnels once and for all. They are prepared to deal with any contingency." He continued: "What is now being said about fresh deployments implies that this will be a long-term operation in Sinai; to put the peninsula under siege and weed out the outlaws." A former member of Egypt's Islamic Jihad group, who is also a specialist on Islamist movements, accused the group now leading the dialogue campaign of seeking to make political gains under Egypt's new political leaders, after amassing enormous financial gains in the guise of 'Islamist lawyers' during the prosecution of these groups under the former regime. "I know the jihadists that this group met with – including Ghorab, Mamdouh Ismail and Magdi Salem – who should be described as 'security men,' not 'jihadists'," the source said. "The jihadist map in Sinai is carved up and cannot be controlled because it is scattered. The core jihadist cells reject dialogue." "Those who sat with them in the past and revised their ideas are now viewed as outcasts," he added. "They also view dialogue with the state as futile because it has not established an Islamic state based on Islamic Law." Thanks Ahram-online. For geniune Sinai security and economic prosperity, Iran's poppet Hamas must go; preferably to hellfire or to sea sharks. Hamas is Iran's local drug lord. You important part of Freedom of Speech to educate the masses after 50 yrs of darkness. Do not surrender to fake Islamists who want to start religious dictatorship. Allah Karbeer Ya Beni Misr. It is true! Hamas/Iran and the past regime corrupted those forgotten people by drug smuggling and MONEY. We need to take care of them and through out Hamas. There will be security in SInai as long as Hamas/Iran are in Gaza. They are flooding Arabia by opiom drugs from Aqabah and europe from Port Fo-ad Malaht. 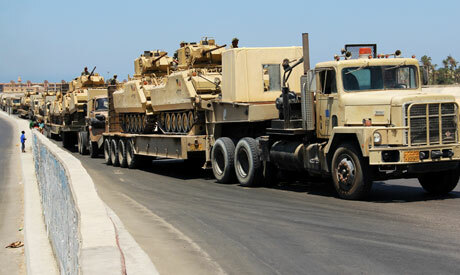 We need more forces in SInai, not less. Egypt will never become a regional power again unless we stop acting like we are slaves of israel and zionism.